Diskutiere das Thema "COS-Bravo - Jelly & ICS & Gb [02/Aug/2012)" im Forum "Custom-ROMs für HTC Desire". Aber es ist noch Alpha und es braucht einen eigenen H-Boot! Fixed GoogleEars, updated Gmail, updated Andreo drivers to the early Jellybean release from Qcom. Ich habe es seit erstellen dieses Threads drauf und bin Begeistert! Kernel: Latest drewis build, with zram, ksm support, new genlock, lzma2, default scheduler BFQ. Gapps are included, the gapps libs are on sd-ext so don't flash other packs over. *You can't change this, in fact it is the only reasonable setup for our device. The system apps and framework are ODEXed which means the dalvik-cache for the most important parts of the system is on the NAND Flash --> speed. Not to mention the fact that we save space by not having the .dex from the system apps and framework both in the Apk and dalvik-cache. We will use the rest of the NAND Flash (the internal storage), around 250 MB for the Apk's data and dalvik (given you don't install 1000 apps, in such a event enable d2sd). I have disabled the sqlite sync feature to speed up things a bit and this should be pretty safe since the db's are stores on NAND Flash which is journaled. Since we are on this subject while flashing the rom im also disabling the Journal of your sd-ext to increase performance. We have no init.d scripts, all the magic is done in the ramdisk. **This is still a bit buggy and the Camera Panorma and the Camcorder are still broke, still seams ok all in all. Falls jemand eine Lösung für das Facebook-Sync-Problem sucht: Ich empfehle die App "Facebook contact Sync" von Danut Chereches. Gibt's kostenlos in Google Play. 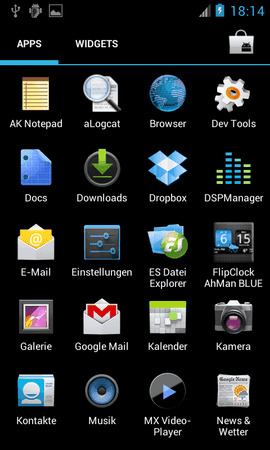 Wer den blauen ICS Theme nicht mag, der kann aus dem Play Store sich einige CM9 Themes installieren. Hier das ROM mit DE Wörterbuch! Available on RomManager and GooManager as well. Changes in handling the CPU freq: implemented the CAF performance class, this will set the max cpu freq to 700 mhz on screen off, increase sampling rate when screen off and put it back when screen is on - saves power, Dynamic Memory Manager, handle io_is_busy - all this req ondemand gov therefor this is default. Enabled Notification count, updates for the HWA Hals, on screen controls for Browser, webkit enhancements to reduce power use and performance. Added the settings part for the battery (under Display settings), Lock screen calendar, Mms : option to not convert SMS to MMS, also can choose when to convert, some cosmetics for the Weather lock screen display, added a few missing gapps libs which made the voice chat fail with gtalk. fixed usb storage, hide media in folders with .nomedia flag, added battery percentage (still have to add a setting) by default, fixed power widget ordering, MUSIC controls on lockscreen and notification, some other fixes i missed before. Resolved the issues in the 17 build. Framework cleanups: PDROID left us, purging of asset bitmaps went back to Gb, added a few more CAF bits, more themable features for TMO engine. Added Pdroid to the normal build as it looks stable, Added option to use a ad blocker (Settings/COS Tweaks), some lil updates. 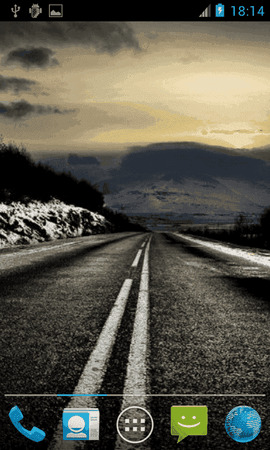 Small Ril fix & added Xperia Home to the alternative launchers. Added a new CPU Setting logic (into settings and framework) a direct, dirty Kang of EzTerry's work here and here this new method allows us to set values for screen off as well, so its cool. Also added NovaLauncher to the alternative Launchers (Settings/COS Tweaks/Default Launcher). Changed the permissions of the zygote process to be restricted to system user which prevents some DOS attack (picked it from AOSP master), renamed Settings/Performance into Settings/COS Tweaks, added option, under COS Tweaks to change the "HOME", for now you can pick from Trebuchet (default), MiHome (MIUI ICS ), AOSP Stock Launcher2. Click, reboot and there it is - based on this "logic" i might add other pick-ables. Customizable lockscreen Settings part: Bring settings up to speed with ux|Fix dissappearing icon bug|Fix npe on packages w/o activities, ICS Ad-hoc support, Music app packed with a bunch of fixes, Mms: Fix for Unicode 6.1 emojis|removed mms splits for now, "virtual" update to 4.0.4_r1.2 (changes nothing tbh ), more stuff pulled off frameworks/base Master. New kernel again(reconcile with drewis kernel tree), fixed a issue with the zram script. Widget issues has been fixed. FC in Settings/Performance/Memory Management - for some languages - fixed. Took out the sense look alike recent apps, update for bash/lsof, Bluetooth Map Profile (CM feature), few fixes from AOSP/master & CAF. New recent application sense 4.0 style by evilisto, option to mute camera sounds, market cache on sd-ext, bunch of fixes. Readded Lock Home/mms in memory (Settings/Performance/Memory Management), added ICS heap size values, up to 256 Mb and actually made the framework read this settings, readded FileManager, added EVWidgets, picked the reduce call delay fix again, support for bmp wave ogg in mms, added openvpn to the build. 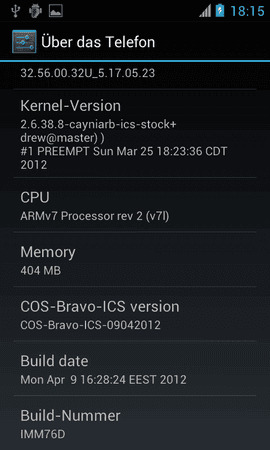 new kernel build, based on drewis's work. Some fixes to CM's framework, added Notification light settings. Dalvik2Sdext not enforced anymore but turn into an option (Settings/Performace/A2sd). Enabled HW mp3 decoder. Some more I/O tweaks(100 points won in quadrant). Changed a prop setup, windowsmgr.max_events_per_sec from 120 to 100, 120 wasn't quite there. Rukur, AlphaRiga, smtraxx und 13 andere haben sich bedankt. OK erster Test, ist echt schnell! Nur ich bekomme WiFi nicht zum laufen und der Play Store FC. Mal die nächsten Build abwarten. Jop habe nochmals alles neu geflasht und siehe da klasse, super smooth und stable. Ich werde es als AlltagsROM verwenden können. 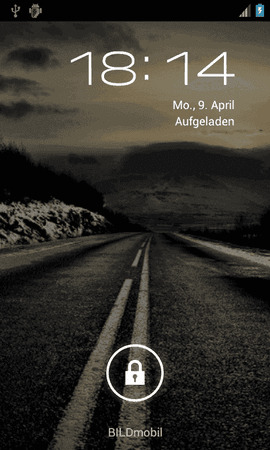 Welche Version (ICS oder GB ) ? Hast du den Stock HBoot ? Gibt es sonst schon Aussagen zu treffen ? ICS screenshot erübrigt sich, da alle gleich aussehen. Aber ich mache gleich welche und werde sie anhängen. Btw roalex hat eine neue Version hochgeladen. Flüssiger als das ics ROM von sandvold? wie siehts mit dem internen-speicher-problem bei unserem desire bei dieser rom aus? Mit dem data++ hboot habe ich ca 30 apps drauf und noch etwa 149 MB frei. Was mich allerdings mal interessieren würde ist ob das eine eigens entwickelte ICS Rom ist oder nur eine die wieder auf Sandvolds Rom basiert? sorry vielelicht sehe ich es nicht kann ich das mit mein Desire nutzen? Ich habe Stock HBoot noch. Leider nicht mit Stock HBoot kompatibel. Musst dir den Data++ flashen, dann wird alles gut. Ja das mit S-ON ist noch aktuell ich bin mir nicht sicher wie ich es genau machen soll. Ob das Vorteile bringt oder nicht gegen über Stock Hboot. Also ich finde schon das es einige Vorteile mit sich bringt, die alternativen HBOOTS wie CM7r2 und DATA++ sind schon besser als das Stock HBOOT und ich gehe davon aus das diese HBOOTs imer mehr vorrang haben. Was aber mein Persönlicher Favoried ist bei S-OFF ist die möglichkeit System APPs die man nicht braucht oder nutzt im laufenden Betrieb ganz einfach mit Titanium zu entfernen was meiner Meihnung nach der Perfomance und dem Akku zu gute kommt da nicht mehr zu viele Apps im hintergrund laufen die man eh nicht für sich selber braucht. Also Programme gibt es nur eins für S-OFF, die andere Methode wäre über eine Bootbare CD. Das revolutionary tool ist auf jeden Fall der richtige Weg würd ich sagen. Einmal starten und das läuft ohne Probleme durch.